I am continually surprised by how much I enjoy this series. Looking back on my reading choices of the past year, I realized how little adult fiction I really read any more. And for the most part, I don't miss it. I enjoy pretty "clean" reads, which you find more of in YA literature---unless you're reading The House of Night series! Jeaniene Frost's Night Huntress series is most definitely not "clean" (with at least one hot and heavy bedroom scene per book), but the superb plot, fast pace and great writing make this series an auto-buy for me. One Grave at a Time felt like it was missing something, though. It was still a great read, but not excellent like its predecessors. I don't know if it was the plot, or the fact that Bones wasn't as involved in this book. I think that the real reason, though, is that this book felt like a filler. It did not get us any closer to resolving any major plot points: Don is still a ghost, we don't know how he'll ever cross over. Cat still absorbs the powers of anyone she drinks. Madigan has taken over in Tate's place, but things there are at a stalemate. And Justina (who is my favorite character) is still hating her vampire self and pining over Rodney. I think the other thing that kept me from loving this book is the development of Bones' new telekinesis. That coupled with Cat's borrowed powers makes Cat and Bones' combined power too unbelievable. It's like they are too strong, too tough, too powerful. It's just too much, in my opinion. Reading over this review, I have complained a lot. What I have not done is tell you how much I really did enjoy the book. The writing continues to be excellent, with a fast pace that keeps me reading and keeps me in happy anticipation. The romance between Cat and Bones still feels fresh after six books. I especially like the minor characters, most of all Justina. Tyler provided some comic relief, and I found myself looking forward to what he would say or do next. 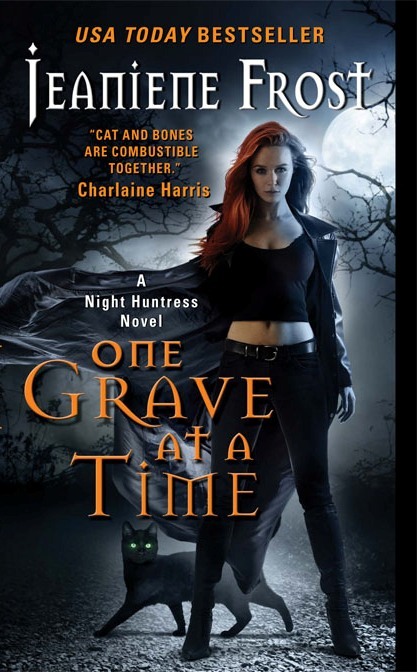 If you have not read any of the Night Huntress series, I would highly recommend them. Jeaniene Frost is at the top of her game! I love Cat and Bones but this book was a bit dry and extremely predictable. This was one of my least favorite of all her books, it was just very bland. The lack of excitement left me not even wanting to finish it but I pushed through hoping for some surprise in the end but sadly there was none.